CONSIDERING PURCHASING A BOAT ? So you see the vessel you have been looking for, and low and behold, its a new baby! But the dealer is offering you a service contract? HERE ARE SOME facts to help you decide if buying a service contract makes sense for you. "Extended “warranties” you have to buy aren’t really warranties; they’re service contracts. A true warranty offers broad coverage and has the weight of state and federal warranty laws behind it. Service contracts, on the other hand, are really insurance policies generally underwritten by third parties, not manufacturers, and are regulated as such in most states. Service contracts have limitations that true warranties don’t. A service contract may cover a broken alternator ($650). But it probably won’t cover consequential damage (when one part causes another to be damaged), so it won’t pay if the alternator damages the engine control unit ($1,300), leaving an owner to pay the difference. Having a service contract won’t protect you from out-of-pocket expenses. Service contracts, like health-insurance policies, usually come with deductibles, often between $25 and $50 per incident. Many contracts don’t pay to remove the engine from the boat or have the boat hauled if it’s required for repairs, so there may be additional expenses for that. responsible, so you should expect better service when there’s a problem. three-year contract on a boat with a one-year warranty, the contract may cover only the last two years. Many service contracts offer a nine-month to one-year window for signing on. of shops, just like healthcare PPOs, and there may not be a facility in your area. Manufacturer-backed service contracts usually perform more like warranties — simply bring in your engine for service, and the dealer takes care of all the paperwork and billing. refund of the same amount, which can be used as part of the negotiations. Most defects in new boats and engines show up within the warranty period, so spending money up front on a service contract may not make sense. Stay safe and use common sense. The National Park Service is urging swimmers and boaters to stay out of the wilderness breach at Fire Island after a rescue last Sunday involving a capsized boat in the channel. Supervisory Park Ranger Jon Swindle, who responded to the rescue scene, said the breach is closed to swimming and boating, calling it a dangerous area that is difficult to navigate. Since the breach opened in 2012 there have been 17 calls for assistance and two rescues,” Swindle said in a Friday news release. The breach, a channel connecting ocean to bay, formed in the Otis Pike Fire Island High Dune Wilderness during superstorm Sandy in October 2012, the agency said. The dynamic features of the breach present a significant safety risk, officials said. Access to the breach’s eastern shoreline is by foot or with a recreational driving permit from the Wilderness Visitor Center; from the western shoreline it may be reached from Davis Park and points west. However, wading, swimming, paddling, and boating in the breach have been prohibited since it opened because of safety concerns and to preserve the primitive character of the federally designated wilderness, the agency said. Also, no signs are in place because of the “dynamic nature of the shoreline,” according to the release. A parks spokeswoman said Friday the agency is studying how best to manage the breach, including whether to allow natural processes to close access or to proceed to manually close it. She said the agency will release a draft breach management plan this fall for public review and comment. In Sunday’s rescue, a boat with three adults and five children capsized after hitting a sandbar about 4 p.m., according to a Bellport Village spokesman. Isabella Rossellini, the actress and model and also a Bellport resident, noticed the boat while walking with a friend on Ho-Hum Beach and called 911, the spokesman said. Rossellini also is the daughter of Ingrid Bergman, the acclaimed Hollywood actress of the 1940s, ‘50s and ‘60s. Three of the children were trapped under the capsized vessel, the spokesman said. They were eventually pulled out by the other passengers as the group “struggled in the inlet’s currents” and ultimately made it to shore at Fire Island’s Otis Pike Wilderness Area, the spokesman told Newsday. There, Rossellini provided towels to keep them warm. Bellport lifeguards stationed at Ho-Hum Beach ran a mile and a half to attend to the group, who were “in a state of shock, with lacerations and bruises,” the spokesman said. They later were taken to Brookhaven Memorial Hospital Medical Center in East Patchogue. Join us September 22-25 at the #NorwalkBoatShow!! As a authorized Volva Penta dealer, we are proud to participate once again! I see all too often, skiers and wake boarders taking unnecessary chances, with the wrong type of tow vessel. From the outside, it may not seem like boats you can ski behind, and purpose-built ski and wakeboard boats are that much different. But there's one crucial difference — propeller location. Because wakeboarders play much closer to the stern, wakeboarding behind a sterndrive or outboard-powered boat is far more dangerous than one built for the purpose, which are inboard-powered. 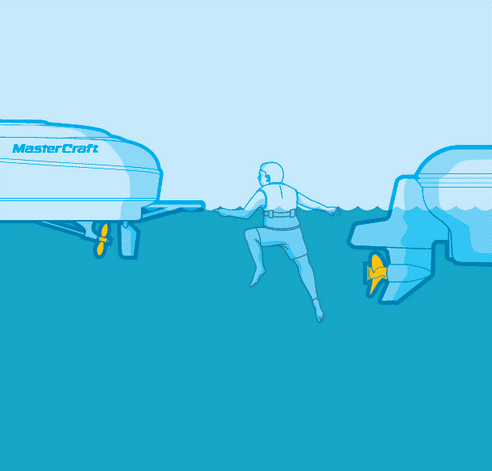 As you can see from the illustration, a skier in the water is much safer with an inboard-powered boat because of how far under the boat the prop is. Regardless of where the prop is, any boat that's picking up a skier should have the engine powered off, just in case. ALEXANDRIA, VA, September 1, 2016 – Behind most successful used-boat transactions, there’s a Purchase Agreement and Bill of Sale that clearly spell out how the boat was bought or sold. While not perfect, this goes a long way to alleviate any misunderstandings. Fort also added that while the two forms were designed to meet the needs of most buyers and sellers, they may want to seek legal advice if there are any questions about whether the forms are appropriate for their situation. The BoatUS Consumer Protection Bureau offers a dispute mediation service, the only national boating complaint database, and provides consumer-oriented information to help boaters make smart buying decisions. The BoatUS Consumer Protection Department now offers both of these documents at no cost online. The new dock, mooring piles, pier and railings comprise a well-engineered system that will allow boating accident victims to be transported directly to the emergency room by water, saving precious time. Joining Santino and D’Esposito at a pre-Labor Day ribbon cutting was Richard J. Murphy, President & CEO of South Nassau Communities Hospital. In emergencies, time is critical,” agreed Richard J. Murphy, South Nassau’s President & CEO. “The new dock will allow us to see patients more quickly and provide an important new point of water access for the Long Beach Emergency Department. The dock and ramp will be utilized by the Town of Hempstead Bay Constables, Nassau County Police Department’s Marine Bureau, the Long Beach Police Department’s Marine Bureau and local fire departments that have marine rescue units. A mock patient transfer was performed by the Town of Hempstead Bay Constables along with personnel from South Nassau Emergency Department, to showcase the efficiency of the ramp when transporting victims of boating accidents. The new structure features two new floating dock sections, where the emergency rescue boats from the various jurisdictions can tie up. Additionally, the boat rescue access dock includes an aluminum ramp with hand rails, an elevated platform, and four pilings. South Nassau also has installed lighting and an intercom system to facilitate communication between Emergency Department staff and first responders. South Nassau staff also is undergoing training on dock transfers of patients to ensure safety of patients and personnel. The new marine structure is more weather resistant and will stand strong for many years to come. The town used in-house labor from the department of Conservation and Waterways to perform the installation. All of the equipment used is commercial grade, and was delivered via a town tug and push boat. Construction of the structure was completed within a week. The total cost of the project was $58,992. Boating is not restricted to the summer, and neither are accidents. The new floating dock will be available year-round and is durable enough to persevere even through the toughest of seasons. In 2015, the U.S. Coast Guard counted 4,158 nationwide accidents that involved 626 deaths and 2,163 injuries as a result of recreational boating accidents. Town and hospital officials have stated that it is their united goal to reduce boating fatalities by making the new boat ramp available to facilitate quicker marine rescues and emergency water transports. Need a early Christmas gift? Wonder why your arm is hurting? There's a new gadget coming out that may help you. Have you ever wanted to bring some tech into your fishing game? The Anglr Tracker’s got you covered. … and is able to keep tabs on your cast count, cast direction and reeling behaviors. It also tracks your catches and the time spent fighting for them. You can even drop pins to mark favorite fishing holes with the push of a button. The Anglr Tracker pairs with your phone via Bluetooth and uses its smart sensors to keep a log of your entire fishing trip. Anglr Trackers will begin shipping this November. Perfect motivation for you to break out your ice-fishing gear. The idea of a “workingmen’s holiday,” celebrated on the first Monday in September, caught on in other industrial centers across the country, and many states passed legislation recognizing it. Congress would not legalize the holiday until 12 years later, when a watershed moment in American labor history brought workers’ rights squarely into the public’s view. On May 11, 1894, employees of the Pullman Palace Car Company in Chicago went on strike to protest wage cuts and the firing of union representatives. On June 26, the American Railroad Union, led by Eugene V. Debs, called for a boycott of all Pullman railway cars, crippling railroad traffic nationwide. To break the strike, the federal government dispatched troops to Chicago, unleashing a wave of riots that resulted in the deaths of more than a dozen workers. In the wake of this massive unrest and in an attempt to repair ties with American workers, Congress passed an act making Labor Day a legal holiday in the District of Columbia and the territories. More than a century later, the true founder of Labor Day has yet to be identified. Many credit Peter J. McGuire, cofounder of the American Federation of Labor, while others have suggested that Matthew Maguire, a secretary of the Central Labor Union, first proposed the holiday. .Labor Day is still celebrated in cities and towns across the United States with parades, picnics, barbecues, fireworks displays and other public gatherings. For many Americans, particularly children and young adults, it represents the end of the summer and the start of the back-to-school season.